We are about to see the end of our current international monetary system. Based on much of the evidence that I have written about previously, this appears to be a certainty. The systematic build-up of this current monetary order went together with the gradual phasing out of silver from the monetary order. This system, by its very nature, has been diverting value away from silver. To understand this, just imagine that silver was actually used as currency (like the paper Dollar is currently used); we would then have much less silver available for sale in the current silver market. Based on the demand and supply economic model, this would then mean that the silver price would rise significantly. The fact that silver is not held by central banks in significant quantities(or not held at all), puts it at a further disadvantage as compared with gold, in the current monetary regime. This is one of the reasons why silver is often mistakenly ignored as real money. The rise of silver and the collapse of the monetary system is inescapably linked. Therefore, if the collapse of the monetary system is not orderly, then the rise of silver's value will not likely be orderly. Collapse by definition suggests: to break or fall suddenly. This would suggest that when the time comes, silver will explode higher suddenly; for example, it could be possible that it rises $10, $20, $100 a day, until you can suddenly not buy it with fiat money. Interestingly, that actually means that silver and gold will reach the same price in fiat currency. So, if you are buying physical silver to hedge against the collapse of the monetary system, you are not buying it, and looking for the price to rise to about $30 at the end of this year. No, you are expecting a sudden explosion of price, you just do not know exactly when. The approach of the silver “stackers” is therefore, the best approach, given that a monetary collapse is inevitable. Due to the fractal nature of markets, I believe that what happened to silver during the 70’s was a prelude to this coming “end of the monetary system rally”. Silver went from $8.70 in August 1979 to $50 in January 1980. That was a phenomenal feat. Few goods (if any at all) have seen such a big increase in such a short time. On the chart, I have marked two patterns with points 1 to 5. 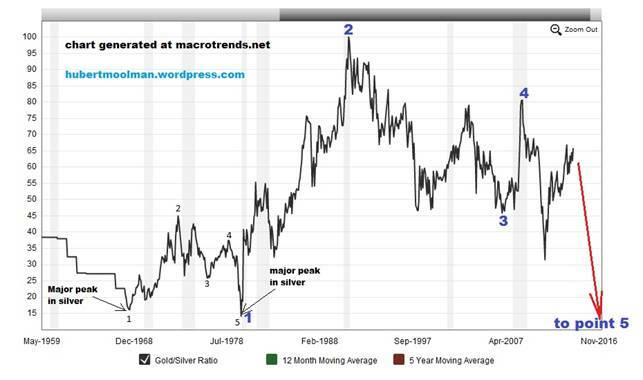 It appears to be a relevant comparison, since both patterns start from a major peak in silver, 1968 and 1980, respectively. Both patterns started at the bottom of the 100-year range of this ratio, in fact, at a major bottom (1968 & 1980). The two patterns appear very similar – similar, but not identical. If the similarity continues, then the current pattern may complete at a point much lower than a ratio of 15. This could mean significantly higher silver prices just like it did in 1979/1980. There are more indicators that support the likelihood of a sudden and massive spike in silver due to collapse of the monetary system. I have also recently completed a Long-term Silver Fractal Analysis Report.